Relieves pain from pressure sores, swollen feet and edema, heel pain and injuries. Even great for swollen pregnancy feet. 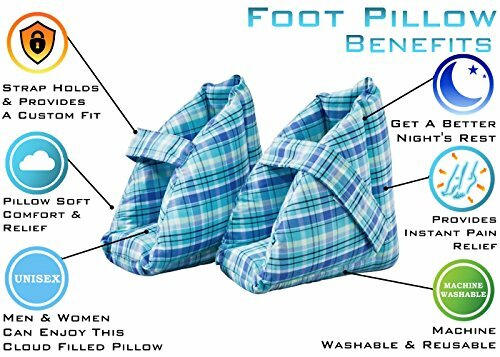 Everyone can benefit from these foot pillows whether you suffer from a condition or just want spa like comfort for your feet at the end of a long day. Finally Get a Good Night's Sleep, Feel the Relief, No more Heel and Ankle Pain Foot Pillow Heel Protector are soft, ultra-plush cloud foot pillows designed to provide relief from skin pressure or comfort for sore, achy feet while in bed or seated by surrounding your feet with super soft pillows. No longer will you have to rest your sensitive feet on hard or irritating surfaces. Constructed of a soft and attractive poly/cotton blend shell with plush hypoallergenic polyfill core, it will feel like resting your feet in the clouds. The velcro closure strap allows you to take them off and on with ease and size them to your desired preference, and are also completely soft against the skin. Your feet will definitely thank you. INSTANT RELIEF-Surround your feet on these extra comfortable fiberfill foot pillows. Your feet will feel like they are on a cloud. Helps relieve pressure from swollen feet conditions, edema, ulcers, pressure sores and helps with recovery from heel injuries or pain. Who wouldn't want a pillow specifically for their feet? Great after a long hard day on your feet as well or for pregnant women as well. There is a use for these for anyone! EASY ON EASY OFF DESIGN-Superior Velcro strap adjusts easily to conform the size of your foot for a secure fit. Easy on Easy Off design. One Size Fits Most. PREMIUM MATERIALS- Our plush foot pillows are made with soft polycotton fabrics, filled with fiberfill core and have a premium Velcro strap that matches the fabric of the foot pillow. EASY TO CLEAN-Just pop these foot pillows into the washing machine. They are Machine Washable and Dryable. We make these out of premium materials that are designed to last a long time. If you have any questions about this product by Active Care, contact us by completing and submitting the form below. If you are looking for a specif part number, please include it with your message.